People who overturn the apple cart don't ask for permission. But it takes more than audacity for a 26-year-old to challenge an entire industry. For Ahmed Khattak, it was personal: He couldn't buy a phone. 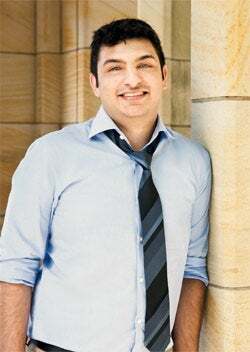 An international student from Peshawar, Pakistan, Khattak arrived at Yale in 2004 at the age of 18 with no social security number and no credit history. That meant no one would sell him a cell phone. He was appalled at the barriers the U.S. cell phone industry threw in front of consumers at every turn. Restrictive two-year contracts? Indecipherable pricing schemes for voice, data and text? And, once he got a prepaid phone, $50 a week just to call his family back in Pakistan? This, from the most technologically advanced country in the world? "I couldn't believe it," Khattak says. In 2007, he went to London for an internship and discovered how to change the game--at the airport, no less, only moments after he got off the plane. "I realized that it was as easy as going to a vending machine, buying a SIM card and [thereafter] paying $22 a month for your phone bill," he says. It was his "eureka" moment: unlocking cell phones, setting them free. "I decided that I had to change the way people in the U.S. go about their plans and phones," he says. His New Haven, Conn.-based company, GSM Nation, had sales of $35 million in 2011, its first full year, and is on track to reach sales of $50 million this year. Three components to Khattak's life help explain how he came to build his business. First, he was exceptionally competitive at squash, good enough to be recruited by Yale. "I am ethnically a Pashtun, and Pashtuns have dominated squash for over half a century. I went on to become a top-10-ranked junior national," he says. The Pakistan Squash Federation is run by the Air Force, the second major influence in Khattak's upbringing. He was a military brat--his father was in the Air Force--so he lived the gypsy life of moving frequently and with little notice, more than 15 times, to cities as big as Karachi and to tiny, remote villages. The third component was his can-do personality. "I have always loved building stuff and fixing it; [I am] a problem solver. I tend to look at everything to see where the stress points are and how to fix them," he says. "I would fix my schoolmates' and neighbors' computers and PlayStations. All this was leading to a bigger venture for me." The chance to study engineering at Yale, his ability to fit into any environment and his tinkerer's bent laid the groundwork for him to tackle the multibillion U.S. cell phone industry. GSM Nation's model is simple: Consumers buy manufacturer-unlocked phones that can be used with any network, then they sign up for significantly cheaper voice, text and data plans through third-party carriers such as H2O Wireless or Simple Mobile--with no multiyear contracts. These carriers resell blocks of minutes they've purchased from T-Mobile and AT&T. Seed capital for the company first came in the form of a $30,000 loan pooled from friends and family; later it would come from Junaid Shams, who co-founded GSM Nation with Khattak. At the time Shams was in medical school at George Washington University (he graduated in May). "In early 2010, Ahmed came to me with this raw business idea," Shams says. "We spent the entire night developing it, talking about infrastructure, financing and concept, basically trying to figure out if it was feasible or not." Raising capital was the first test. Once the company had revenue, Khattak and Shams raised an additional $120,000 in loans. A year after launch, capital arrived from an unlikely angel investor: Khattak's dentist. Needing a root canal (but with no way to pay for it) Khattak searched locally for an endodontist who would do the work on credit. When he ran across the name Moin Ahmed, he thought, Sounds like he's from my part of the world. Sure enough, Ahmed was a fellow Pakistani, and he told Khattak not to worry about the money. As GSM Nation stirred to life, Ahmed mentioned that he was seeking a place to park some private capital; Khattak suggested he write a check against equity in the company. Bang: Khattak landed $200,000. Ahmed Khattak of GSM Nation. Did the endodontist see the growth potential in GSM Nation from the start? "Not at the time," he says, "but I wanted to help Ahmed in his venture." Believing in the man more than in the business itself, he handed Khattak the check. With desperately needed capital in hand, Khattak ramped up inventory, and two friends from Yale joined the company. Still, Khattak ran the show. "I am a very independent person, so I really don't like a lot of interference. I didn't seek a lot of help at all," he says. Indirect help came from the Yale Entrepreneurial Institute, which gave him a tiny office space and required him to produce quarterly reports. "It instilled a great deal of confidence in me, and I owe them for that," he says. GSM Nation was an instant hit. "It's hard to put a finger on a particular occasion when I thought we were going to be successful," Khattak says, "because we have surpassed our wildest imaginations. I mean, think of it, in excess of $50 million in sales in just over two years. We have taken such huge leaps that every six months we have a new aim and we literally treat that as our starting point." He estimates the total market for his industry is $2 billion to $3 billion--but growing fast. "Fifty to 70 percent of T-Mobile activations came from contract-free plans in the past year, and now all carriers are going into this segment," he says. This translates into more sales for the likes of GSM Nation. Soaring growth poses the immediate problem of cash flow. On this point, Khattak and Shams agree. "I think the biggest mistake we made in the early going was not having as much funding as we originally thought we needed," Shams says. "We were growing so fast [in] the first six to 12 months, faster than what even we had expected, that we didn't have the funding at the time necessary to allow us to grow at the same pace." Many of GSM Nation's wholesale clients are based in Asia, the Middle East and Europe. So after a long day at the office, Khattak returns home, and calls begin coming in from the other side of the globe. With Khattak clocking 20-hour days, GSM Nation sidestepped major crises in its first year. Ever the problem-solver, Khattak admits he was constantly putting out smaller fires. The greater challenge is that there are practically no barriers to entry in the unlocked cell phone market, so the company must continually raise its game. "[It makes] the landscape insanely competitive; we started a company that was essentially a repository of information for people, and then if they wanted a device they could buy one," Khattak says. "It might sound stupid, but our philosophy is to make sure the person who calls wants and needs what he thinks he does … We are not the cheapest in the industry, but we are the best. A lot of our competitors try to compete on pricing, and they never get anywhere." GSM Nation certainly has its fans: A scan of reviews on ResellerRatings.com turns up myriad gushing comments (e.g., "You guys need a Superman cape."). Yet cash flow remains the biggest obstacle to growth. "If I had a few million [dollars] more, I would do $200 million in sales this year," Khattak says. Meanwhile, operations are lean at the New Haven headquarters. With just 14 employees, the company relies heavily on contractors. The work environment is casual, with "no sense of hierarchy." As for his management style, Khattak says, "I am the kind of person [employees] respect and don't want to disappoint because of my love for them, as opposed to them being scared of me." Was Khattak ever frightened of failure? "Absolutely--still am. The fears are different, though. In the beginning, it was more along the lines of, I would have to go back to Pakistan having failed at something, and my friends and family wouldn't understand," he says. Today his fears are of disappointing customers. The fire dance of cash flow to keep product moving means that GSM Nation operates on a precipice. So far, Khattak has managed this dance. And it hasn't distracted him from the pleasures of starting a business. "It's incredible coming to work every day and seeing what you have done," he says. "I am obsessed with growing my company to thousands of people ... the fact that I can get the thing I desire and [share] it with my friends and family is a good perk." On a Saturday afternoon in San Francisco, the fog has burned off, and it's a gorgeous summer day. Khattak has flown in early for meetings. He speaks rapid-fire, his brain clearly buffering half a dozen ideas that simply can't make it into words fast enough. Despite the demands of GSM Nation, he is already at work on his next venture, eDrop.com, a new way of social shopping for great bargains. "I have assembled an amazing team," he says. "We are going to release our first beta in [September] and hopefully go into a nice round of funding by October." Khattak checks, then pockets, his iPhone and bids goodbye. He is taking a meeting at the airport, then flying back to Connecticut the very same day he flew in. Why? In spite of the insane hours he commits to his work, he reserves one day a week to spend with his wife and son to enjoy the fruits of his American dream. When a twentysomething vaults into an industry with no experience, no contacts, very little capital and meager working knowledge about American business, you have to ask, How did he make this magic? Here's what other entrepreneurs can learn from the success of GSM Nation's Ahmed Khattak. Do your homework. "It's fine to get into uncharted territories, but once you get in, do your research," Khattak says. "Too many entrepreneurs spend too much time doing risk analysis [before they take action]." Find paying customers ASAP. James Boyle, managing director of the Yale Entrepreneurial Institute, where GSM Nation was born, emphasizes the practical: "One of the pieces of advice we give students is to focus on finding the first paying customer as soon as possible. Whether you're familiar with an industry or not, the process of getting someone to pay you money teaches you a great deal about challenges and opportunities in that space." Balance the grand vision with immediate action. Ka Mo Lau, co-founder and CFO of advertising tech startup PaperG, calls out fellow entrepreneur and friend Khattak for his ability to move things forward: "Have a grand vision for where you want to go, but like Ahmed, execute on practical, immediate actions that bring you closer to that vision every day."